This artifact is an Adler J5 typewriter from 1975. It has a plastic exterior and four horizontal rows of keys that make up the keyboard. Keys are in a standard English language format called “QWERTY” because those are the first six letters on the keys starting at the left side of the top row. The typewriter rests on a table, and the user, called the typist, sits facing the keyboard. When the typist’s finger pushes a key, the action moves a short metal lever. That, in turn, lifts another metal lever called a hammer that has raised letters on the end. One by one, hammers hit the inked typewriter ribbon, and leave printed impressions of the letters on typing paper that’s been wound on a roller. The roller is on a moveable carriage that advances so that letters only strike one at a time making words. A typist hits a space bar each time empty space must come between two words. With lots of practice, typists can train their fingers to hit assigned keys, even when they are not looking. This is called touch typing. People who compare typing on a typewriter to typing on a computer say it takes a much harder strike to push typewriter keys. Even so, a good typist could type more than 40 words per minute. In the decades that preceded the industrial revolution, inventors from around the world were transforming the mechanics of the printing press into a writing machine that could serve both public and private functions. Many of the early models suffered from limitations in both vision and technology; the public found it easier to write by hand than deal with machines that often jammed. It wasn’t until 1870 that Rasmus Malling-Hansen invented a typewriter that could be sold commercially. Built in Denmark, these early models incorporated a writing ball and solenoid. 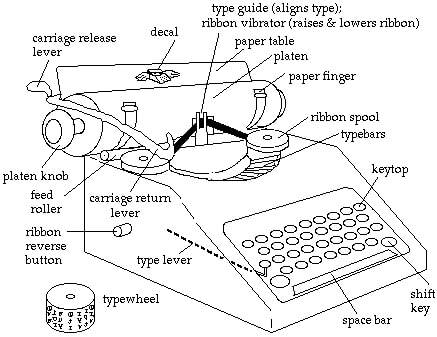 In America the 1868 Sholes/Glidden prototype was made by machinist Mathias Schwalbach and included the first QWERTY keyboard, designed to slow the speed of the typist, thereby solving the problem of keys jamming. Five years later, the Remington #2 typewriter introduced the shift bar, eliminating the need to have both capital and lowercase keys. Throughout the 20th century, the typewriter evolved, leading in 1928 to the IBM Electric, and in 1961 to the Selectric, which became the gold standard for typewriters by using the round typeball originated 90 years earlier! ​By the 1970s and ’80s, personal computers began to replace the typewriter; however, many still enjoy collecting vintage models. The Adler typewriter in this photo was donated to MOTAL by Barbara Park of Stanton in 2013. Barbara was battling ovarian cancer at the time, yet she was determined to place her valued possessions in new homes. She put out a call in the local newspaper for letters from those who were interested in the typewriter. Barbara decided that Greta Nagel’s letter about housing the typewriter at MOTAL where it would be appreciated and enjoyed by visitors of all ages was compelling. Her beloved typewriter is now one of the museum’s vintage teaching tools. wikiHow.com's page on typewriters includes a variety of information on typewriters.